Automatic overclocking up to 2666MHz. HyperX® FURY DDR4 automatically recognizes the platform it's plugged into and automatically overclocks to the highest frequency published, up to 2666MHz, for hassle-free, plug-and-play functionality. It delivers automatic top-level performance for motherboards featuring Intel's 200 series and X99 chipsets and complements Intel's 2, 4, 6, 8 and 10-core processors for faster video editing, 3D rendering, gaming and AI processing. 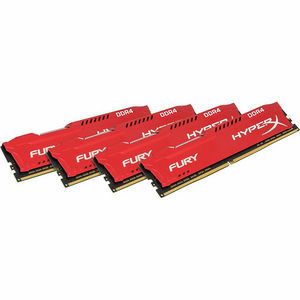 Available in speeds from 2133MHz-2666MHz, CL14-16 latencies and capacities of 4GB, 8GB and 16GB single modules and 8GB-64GB kits, HyperX FURY DDR4 is a minimal investment in premium components that results in faster speeds, higher performance and enhanced reliability - plus it looks really cool. It stays cool, too, thanks to 1.2V power consumption resulting in less heat, with a lower voltage specification than DDR3. Its stylish, low-profile design complements the look of the latest PC hardware while helping you stand out from the crowd of squared designs.